When it comes to escaping from the world and having some fun with friends what beats a night out at the movies? Help your friends’ dream movie stars come to them, by giving them the gift of entertainment – an AMC Gift Card! 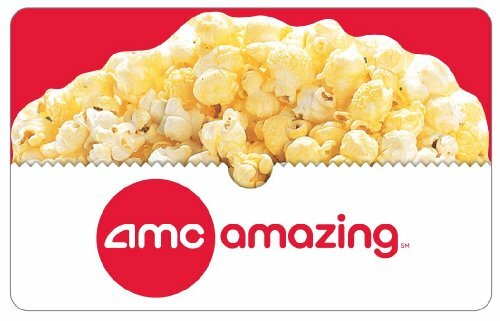 AMC Gift Cards are good for both movies and concessions which is good because we all know that popcorn and a soda can be pretty expensive these days. Even better, AMC Gift Cards do not have any fees or expiration dates – so that means your gift spans the test of time. In the words of “Cousin Eddy” from “National Lampoon’s Christmas Vacation:” “That’s the gift that keeps on giving the whole year.” Headquartered in Kansas City, Mo., AMC Entertainment Inc. is a leading theatrical exhibition and entertainment company – we’re good at what we do and we’ve been doing it for a long time. With a history of industry leadership and innovation dating back to 1920, the company today serves millions of movie-goers annually through interests in over three hundred theatres with over five thousand screens in four countries.